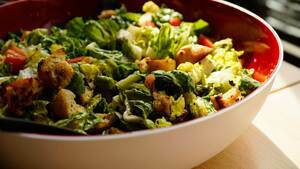 This salad is high in protein and comes with some tasty homemade croutons. It's simple to make and great for you. 1. Chop the salad and coriander and mix together. 2. Cut the bread into chunks. Heat some oil in a frying pan and throw the cubes in. Fry them until crispy and golden, then remove to a plate covered in kitchen paper and allow to cool. 3. Whisk the vinaigrette ingredients together. 4. Bring a pan of water to boil. Carefully place the eggs in and boil them for 7 minutes. Then remove them, run them under cold water and peal them. Chop them into chunks. 5. Combine everything in a bowl and drizzle with the vinaigrette.